These Celtic wedding invitations are not only unique and beautiful but also very easy to make. They were super easy because they were essentially simply scrapbook paper folded to create a gatefold wedding invitation, and warpped in a matching ribbon. Although the paper was created to look the way it does you can create a very similiar effect by finding a pattern paper (or creating one with rubber stamps) and then simply stamping a Celtic decoration up and down the middle folded seam, or anywhere on the front of the invitation. I chose to use a 12 by 12 paper, not only for the beautiful Celtic inspired print, but also because it is perfectly sized for making a 6" by 6" homemade invitation! So the first thing you want to do is cut the paper to the correct size. You can certainly cut them yourself (to save a few bucks) using a good personal paper trimmer/cutter but I also recommend having them cut for you if you are pressed for time or cringe at the thought of cutting large quatities of paper by hand. If you take your paper to a print or copy shop you can have them cut on a hydraulic cutter that will cut all of your paper sheets in one fell swoop. It is cheap, and it saves a ton of time and tedious work. You can even opt to have the wedding wording copied onto your paper while you are at it. Your paper should be cut in half to create two pieces of 12 x 6" paper which will be folded to create the outside of the Celtic wedding invitations. 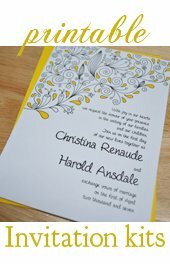 You should have also chosen a cotton or handmade paper (even a printable vellum) to attach to teh inside of the paper with your invitation wording printed within. Depending on the size of your chosen paper will be the size you cut this paper to. A standard 8.5 by 11" cut into quarters will work out nicely. The next task will be to print the wording for your invitations onto the paper you cut into quarters. I used a faux handmade paper, but you could also choose a nice cotton stationary or even another decorative paper or vellum. You will also need to work out printing the wording onto your the chosen paper. You can very easily use a word processing program set to print into columns. I also have some very handy templates for printing DIY wedding invitations as well as all purpose invitation templates to help out in just this sort of task. Now to fold the decorative paper to create these Celtic wedding invitations. It is very helpful to score the invitation paper before folding, but is not completely necessary. To figure out where to score the paper first figure out where the exact middle of the paper is. If you are using a 12 x 6" paper then 6" will mark where the middle is. Next you would measure where the center is between the middle of the invitation and the outer edge is. You want the fold to fall just short of this mark so that the sides over-lap. To make this much more simple (it's a little confusing to explain, I know) simply make a mark at 3 1/4" in from the edge on both the left and right. This is where you should score the paper. If you are not scoring the paper then simple hold the paper the wide way in your hands. Bring the sides to the middle of the card so that they over-lap by about a 1/4 of an inch. Now press down to the edges to create the fold. Use a flat edge to smooth the crease, such as the edge of a metal or wooden ruler. 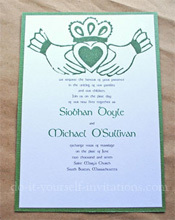 Use a adhesive glue runner to attach the wedding wording paper to the inside of the Celtic wedding invitations. All that need to be applied is one small strip of glue across the top of the underside of the paper. 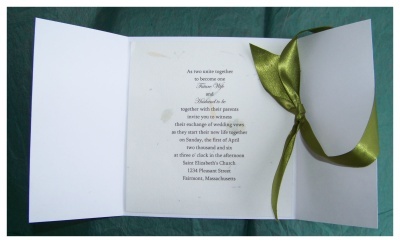 Carefully center the paper to the inside of the invitation and press down firmly. To finish the invitations cut a length of ribbon about 15 to 18 inches long. Tie this ribbon around the front of the card to hold it shut. Make a simple knot. Use a sharp pair of scissors to snip the ends off of the ribbon at a diagonal angle. 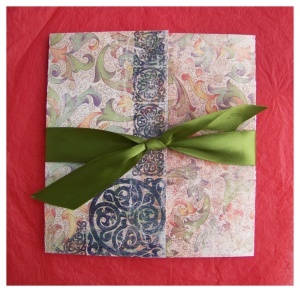 Creating a celtic inspired pattern paper yourself by hand can be a rewarding experience as well. All you needis a well chosen set of celtic and pattern rubbern stamps, along with some coordinating colored inks. Choose one ink for a pattern and apply the image all over a sheet of paper in colored inks, covering the entire sheet. 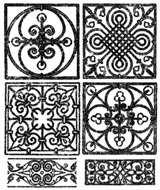 Next stamp a Celtic pattern along the edge in a boldly colored (or black) ink to emulate the Celtic wedding invitations I created above. If you would like to try and get your hands on the decorative scrapbooking paper I used in this tutorial it is called "once upon a time print" 12 x 12 castle tapestry by D.C.W.V. I have seen it available in books as well. A very good choice for a princessy "once upin a time" theme wedding. And the paper can be used for all sorts of DIY wedding goodies! The paper I used for the inside of the invitation is a faux handmade paper made by "the Paper Company".